Research expenditures in the Department have averaged $10 million per year. Our researchers are involved in many interdisciplinary programs and research centers on campus, including the Institute for Materials Research, the Biomedical Engineering Center, the Molecular Biology and Biotechnology Program, the University Cell Analysis and Sorting Core, the Ohio State Carbonation Ash Reactivation (OSCAR) demonstration plant, and the Environmental Science and Engineering Program. Our students enjoy the unique opportunity to interact and work with top scientists from leading edge research centers and institutes on and around campus, including the Comprehensive Cancer Center, the Cleveland Clinic Foundation, the Mathematical Biosciences Institute, and Ohio State’s Heart and Lung Institute. Ohio State Engineering faculty, staff, and students operate in a competitive global market place where engineering designs and products are increasingly integrated into global networks and supply chains. Through strategic investments and targeted collaborations, The Ohio State University College of Engineering is positioned to be a leader in international engineering education and research. This website offers information for faculty (international agreements and dual degree programs) and alumni, as well as information for students (Global Option in Engineering Program and engineering study abroad programs). The department occupies more than 60,000 square feet of space and houses state-of-the art research facilities. Several million dollars in funding from federal, state, and industrial sources, such as the National Science Foundation, the National Institutes of Health, the Environmental Protection Agency, the Department of Energy, the Department of Defense, the Ohio Board of Regents, and several major chemical companies, recently have been used to equip our laboratories with state-of-the-art research equipment in various frontier areas. Our bioprocessing laboratory is equipped with bioreactors and fermentors—from 5 liters to 150 liters—with automatic computer control and validation. The biochemical engineering and cell culture laboratories house a wide range of biotechnology research equipment, including HPLC, FPLC, GC-MS, ion chromatograph, capillary electrophoresis, microplate readers, Coulter cell sizers, thermal cyclers for PCR, 2-D protein gel electrophoresis, a gel documentation system, and a fluorescent microscope with a digital camera. 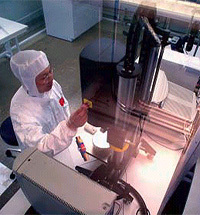 The polymer and composite processing laboratory is equipped with resin injection pultrusion, compression molding, injection-compression molding and gas-assisted injection molding machines, and a twin-screw extruder with supercritical CO2 injection, an Instron micro-tester, and a clean room for microfabrication of bio-MEMS devices. Our rheological measurement laboratory has a mechanical spectrometer, a fluids extensional analyzer, a solids analyzer, and a fluids spectrometer that can test samples from rigid solids to low viscosity liquids and even to reacting systems. Equipment in the colloidal and particle technology laboratories includes an atomic force microscope, a dynamic light scattering apparatus, a flow birefringence system, an imaging ellipsometer, a Brewster angle microscope, Langmuir troughs for BAM analysis and spectroscopic analysis of monolayers at liquid/vapor and liquid/liquid interfaces, Sensadyne bubble tensiometer, Cahn dynamic contact angle system, an image analysis system for sessile and pendant drop analysis, HPLC with evaporative mass and UV detectors, particle size analyzers, various testers for powder flow and mechanics, and turbulent flow heat transfer and drag reduction circulation loops. The multiphase flow and reaction engineering laboratories house pilot scale circulating fluidized beds and high pressure and temperature flow visualization systems. For fluid mechanics research, there are a variety of flow facilities available that include an opposed jet mixer, a dual moving wall linear couette flow system, a circular couette flow system, and a fourmill roll for stagnation flow studies. Each of these systems can be used with our particle tracking velocimetry (PTV) systems that can provide full-field, time-resolved velocity vector measurements. A novel, real time, three-dimensional Electric Capacitance Tomography (ECT) developed here allows measurement of gas-liquid-solid flow field. Specialized equipment used in catalysis and reaction engineering research includes laser Raman spectrometers, GC-MS, a high-pressure porosimeter, a chemiluminescence NOx analyzer, a thermo gravimetric analyzer, and an atomic absorption spectrometer. The OSCAR Pilot Plant, a multi-disciplinary integrated design that has 10 unit operations and a sophisticated automated measurement and control system, offers an unparalleled platform to support research in the clean coal technology. The thermodynamic and separation laboratories have several custom-designed highpressure apparatuses for measuring phase equilibria and physical properties in solid-liquid-gas phases, supercritical fluid extractors, a high-pressure transient adsorption apparatus, and also membrane systems for microfiltration, ultrafiltration, nanofiltration, and reverse osmosis. The department also has a pilot-scale pulsed extraction column and a computer-controlled 12-tray bubble cap distillation system. The membrane research laboratory is well equipped for the synthesis and characterization of new membranes for separations and has reactors for the synthesis of new membrane polymers, casting devices for the fabrication of flat-sheet membranes, gas permeation units capable of handling CO and H2S, a water-gas-shift membrane reactor, and a supported liquid membrane system. Major research equipment and analytical instruments such as NMR, ESR, an X-ray crystallograph, scanning and transmission electron microscopes, confocal laser scanning microscopes, flow cytometers, real-time PCR, and DNA synthesizers and sequencers are also available on campus. The department has machine and electronic shops for the design, construction, and repair of research equipment. All students and faculty in the Department have access to extensive computing and information resources located in the chemical and biomolecular engineering and materials science complex on Ohio State’s campus. More than 100 computers with the latest technology are available to support innovative teaching and cutting-edge research. A large array of software enables 3D imaging of atomic structures, diffraction analysis, mathematical modeling, casting simulations, stress analysis, and a variety of other engineering capabilities. Gigabit Ethernet switches provide quick access to a wide variety of resources, including internet-based materials databases as well as e-books, journals and search engines offered by The Ohio State University and Ohio-link Information Network. DVD recording, color laser printing, large format plotting, digital video recording and editing, and high-resolution scanning provide students and faculty with the tools needed to prepare professional presentations and manuscripts. 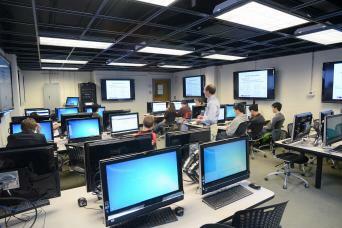 In 2011, three of the computing rooms in the facility were renovated to support classroom instruction in computational material science. The novel design includes TouchSmart computers, custom tables, wall-mounted flat panel displays and digital white boards to help convey technical information. Clustered seating and interactive switching enable student teams to display their information to other team members or the entire class. Both on-campus and distance students benefit from on-the-fly recording of lectures that can be streamed live or archived for reference. Students enrolled in Chemical and Biomolecular Engineering and Materials Science programs at Ohio State pay a computer fee to use the ECR6 facility, one of several computer laboratories available to students in the College of Engineering. Staff and faculty have access to the 512-CPU (2.4 GHz Intel Xeon) Beowulf cluster at the Ohio Supercomputer Center located on Ohio State’s West Campus. The Center holds frequent training sessions on parallel programming and performance optimization, and also offers Cray supercomputers for demanding computational projects. Analytical Cytometry Shared Resource (ACSR) - Analytical Cytometry is a quantitative analytical method that separates cells based on specific characteristics. It can also measure physical and chemical properties of cells and particles. ACSR provides state-of-the-art flow cytometry analysis and sorting of cell populations using selected cellular markers. Flow cytometry is a critical technology for cancer research, and the ACSR is used extensively by all scientific programs in the OSU Comprehensive Cancer Center-James Research Center, and by the broader Ohio State research community. Center for Automotive Research (CAR) - The United States' preeminent research center in sustainable and safe mobility and an interdisciplinary research center in The Ohio State University's College of Engineering. Center for Emergent Materials - Engages researchers from multiple disciplines to work in teams on scientific problems too complex for a single researcher to solve. Established in 2008, it is funded by a National Science Foundation MRSEC award. Center for Resilience - Exploring risk, resilience, and sustainability in complex industrial systems. Comprehensive Cancer Center - Research, education and patient care form the three-part mission of the OSUCCC–James. The three are tightly intertwined and focused on one goal: creating a cancer-free world. The OSUCCC–James is one of only 45 comprehensive cancer centers in the nation as designated by the National Cancer Institute (NCI), a designation maintained through competitive renewal since 1976. The Center's last site renewal earned it the NCI's highest ranking - "exceptional." and the Center earned a five-year, $23 million NCI support grant. The NCI survey team stated that the OSUCCC–James "should serve as the model for other matrix university-based centers." Institute for Materials Research (IMR) - IMR represents more than 150 faculty members and research groups engaged in materials research from 5 colleges and more than a dozen departments at OSU. With a network of state-of-the-art facilities throughout these departments and colleges, IMR provides coordination for a dynamic, world-class and multi-disciplinary materials research community that incorporates science and engineering from the sub-nano to macro scales, from soft to hard materials, from basic phenomena to devices, and from biology and medicine to agriculture, energy, communications, transportation and computation. IMR has a special mission: to create and sustain a coordinated, state-of-the-art environment that fosters collaborative, interdisciplinary research in the science and engineering of materials that addresses the future needs of society. Mathematical Biosciences Institute(MBI) - MBI catalyzes interactions between the biological, medical and mathematical sciences through vigorous programs of research and education, and nurtures a nationwide community of scholars in this emerging new field. Ohio Bioprocessing Research Consortium (OBRC) - A central bioprocessing facility located on the Ohio State University campus (S.-T. Yang, Director). The Nanotech West Lab - The largest nanotechnology user facility in the State of Ohio. With currently over 200 total internal (Ohio State) and external users, Nanotech West supports more than 80 research and development projects per year including use by over 30 external users, predominantly startup companies in the Ohio region.